Babylonian amora of the third century; disciple and fellow of Rab (Ber. 27b). In Yerushalmi his patronymic is often omitted (comp. 'Er. 21a with Yer. 'Er. ii. 20a; see also ib. 19d and Abina). 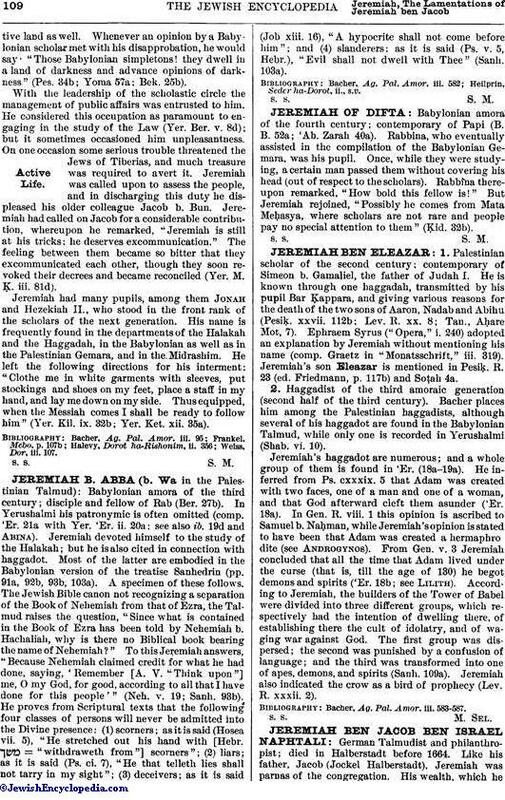 Jeremiah devoted himself to the study of the Halakah; but he is also cited in connection with haggadot. Most of the latter are embodied in the Babylonian version of the treatise Sanhedrin (pp. 91a, 92b, 93b, 103a). A specimen of these follows. The Jewish Bible canon not recognizing a separation of the Book of Nehemiah from that of Ezra, the Talmud raises the question, "Since what is contained in the Book of Ezra has been told by Nehemiah b. Hachaliah, why is there no Biblical book bearing the name of Nehemiah?" To this Jeremiah answers, "Because Nehemiah claimed credit for what he had done, saying, 'Remember [A. V. "Think upon"] me, O my God, for good, according to all that I have done for this people'" (Neh. v. 19; Sanh. 93b). He proves from Scriptural texts that the following four classes of persons will never be admitted into the Divine presence: (1) scorners; as it is said (Hosea vii. 5), "He stretched out his hand with [Hebr. = "withdraweth from"] scorners"; (2) liars; as it is said (Ps. ci. 7), "He that telleth lies shall not tarry in my sight"; (3) deceivers; as it is said (Job xiii. 16), "A hypocrite shall not come before him"; and (4) slanderers; as it is said (Ps. v. 5, Hebr. ), "Evil shall not dwell with Thee" (Sanh. 103a).